I’m reblogging this because it expresses so much of what I feel, both as a South African and as a citizen of the world. 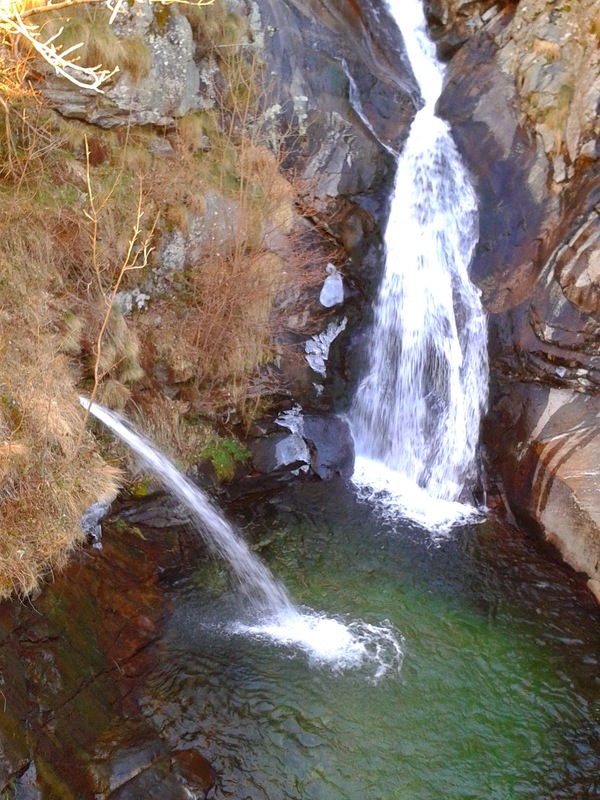 And the photographs are beautiful! Then parching leaf and vale. 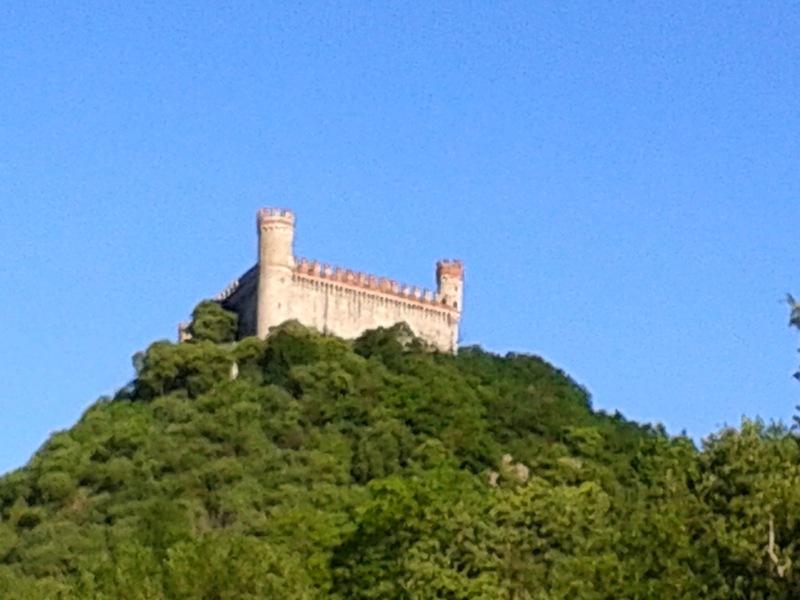 With each heavy, sun-scorched day. She burst forth her bounty. Crisp morns and howling winds. She cloaked our love in icy mirth. As we journeyed to love’s ecstacy. Yesterday was Cleaning Day and I hate Cleaning Day! Perhaps I should qualify that: I hate the process but I love the result. There is nothing like the smell of a freshly dusted and polished house or the feel of a newly washed floor underfoot. Anyway, since it was a hard day cleaning, it had to be an easy day cooking and nothing is easier than pasta, in my book. 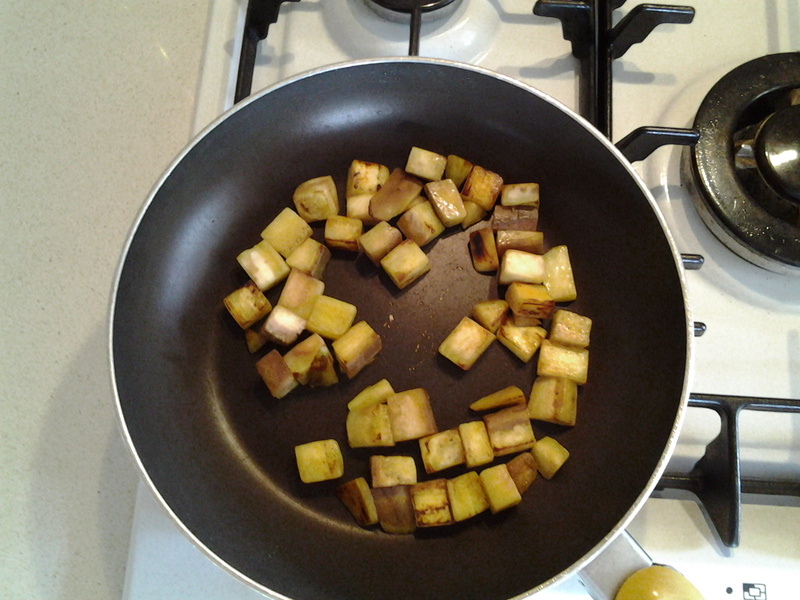 A quick look in the fridge revealed an aubergine begging to be eaten and a plan began to form. 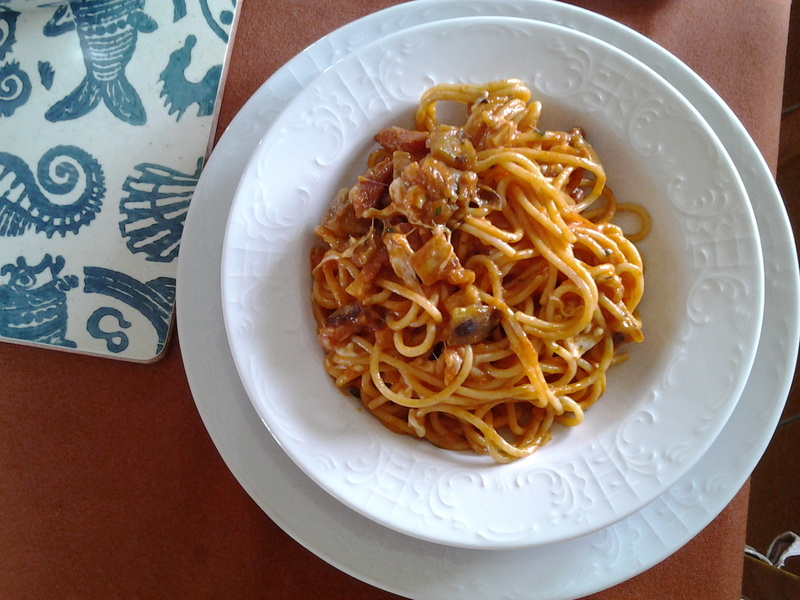 This recipe is based on a recipe from an Italian recipe book, but I tweaked it with the addition of bacon bits. My daughter has the firm belief that there’s nothing that can’t be improved with the addition of bacon, and I tend to agree. If you want the authentic recipe, just leave out the bacon. The ingredients are enough for two hungry people as a main meal. If you serve this as a primo, Italian style, then it would probably serve three or four people. 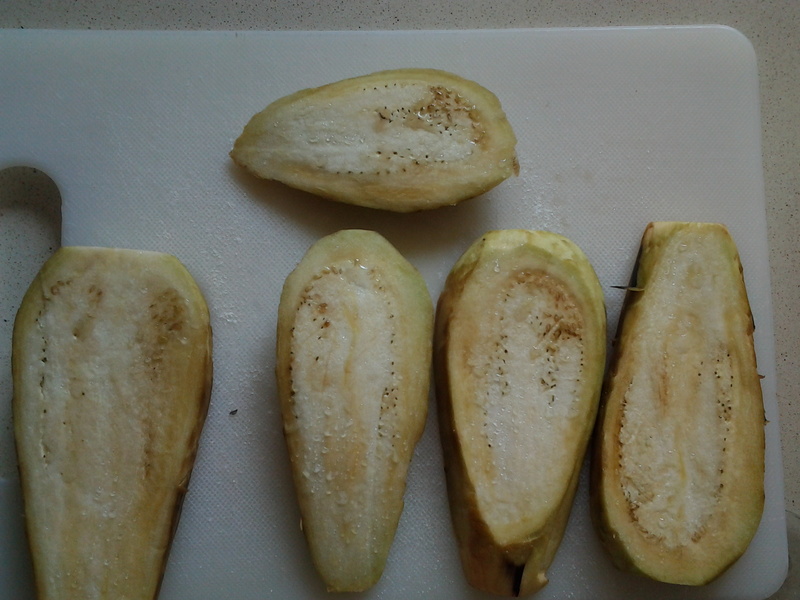 Peel and slice the aubergines in thick slices. Salt them and leave them to draw for twenty minutes. In the meantime, peel and dice the onion and the bacon if it isn’t already diced. Prepare the basil leaves and keep them aside. Fry the bacon and onion together. You can add a little oil if needed. I always fry my onion until it is soft as I don’t like it crunchy, but you do it the way you like it. It should be golden and delicious. Mmmmm….can you smell that delicious onion and bacon smell? Now prepare the aubergine. Rinse and dry the slices well. 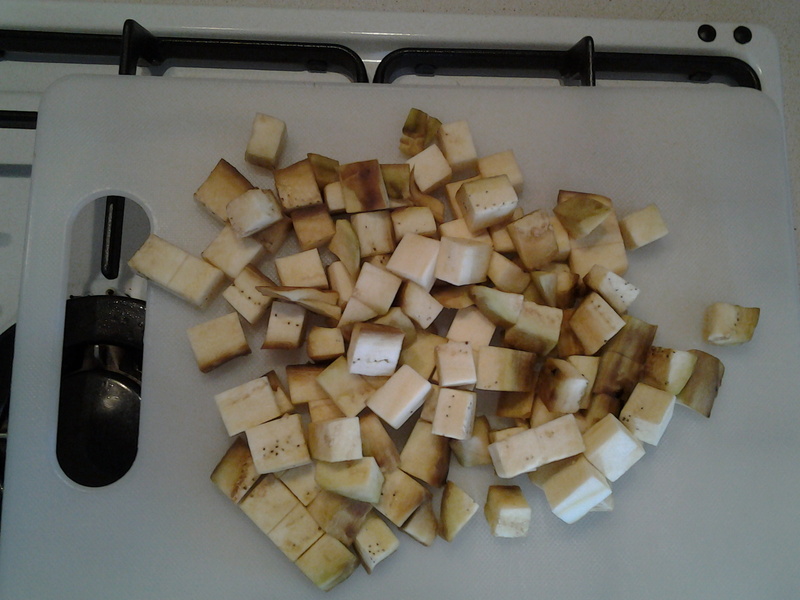 Cut them into squares and fry them in a little hot oil. They will absorb the oil. When they have browned all over, drain them on kitchen paper. Be careful not to let them brown too much! 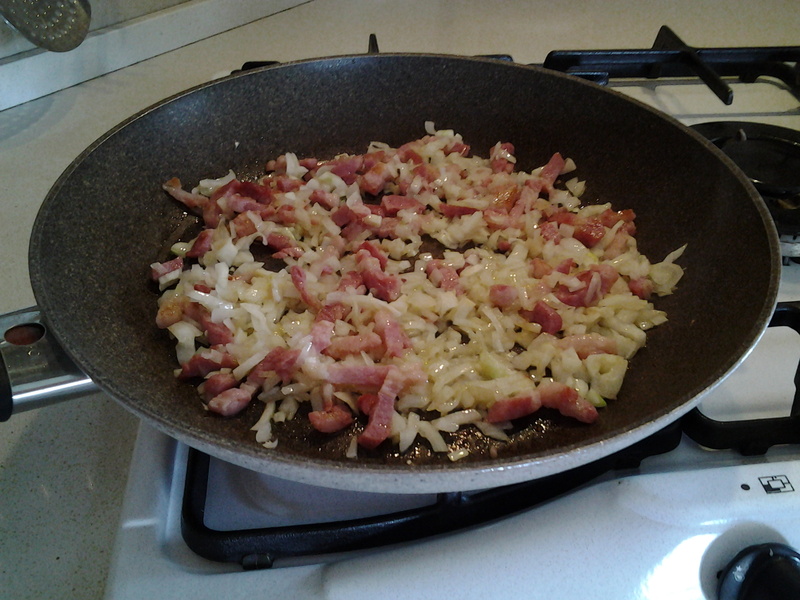 When they are ready, add them to the pan with the bacon and onion. 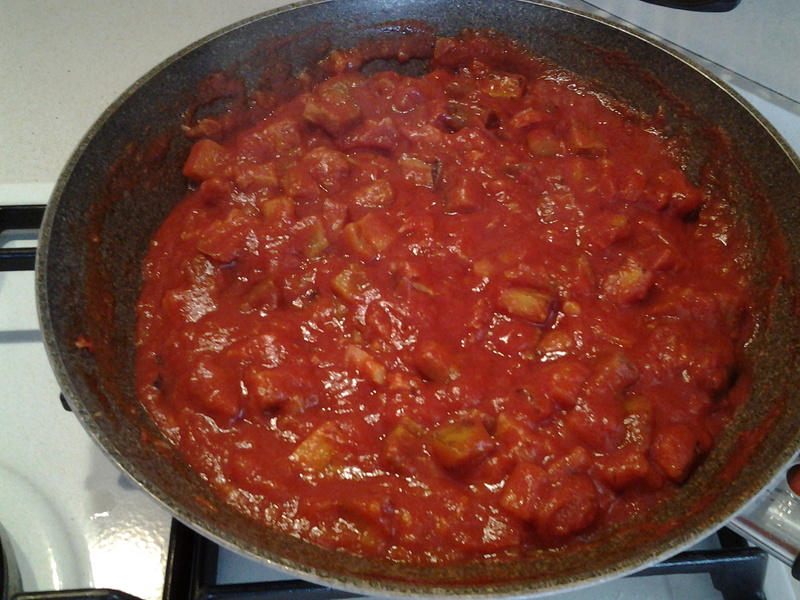 Add the passata, salt and chilli pepper to taste and allow to cook until the brinjal is cooked through and the sauce is rich and glossy. 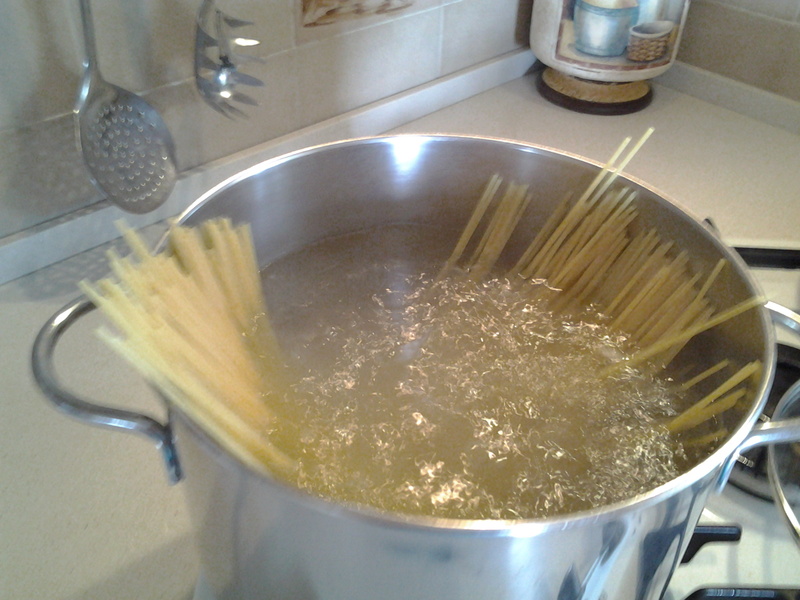 You need a large pot because pasta needs to cook in lots of water. None of this shoving it in a tiny pot. You need one this size and the water must be boiling with a rolling boil before you put the pasta in. Add lots of salt to the water. According to one italian saying, the pasta water should be as salty a the sea. Add the spaghetti to the pot in one piece. Do not break it or you’ll spoil the chance to eat it like an italian, slowly slurping in those stray strands that wouldn’t twirl on the fork. The strands slowly sink into the water as they soften and you can help them with a fork, turning and mixing them slowly. 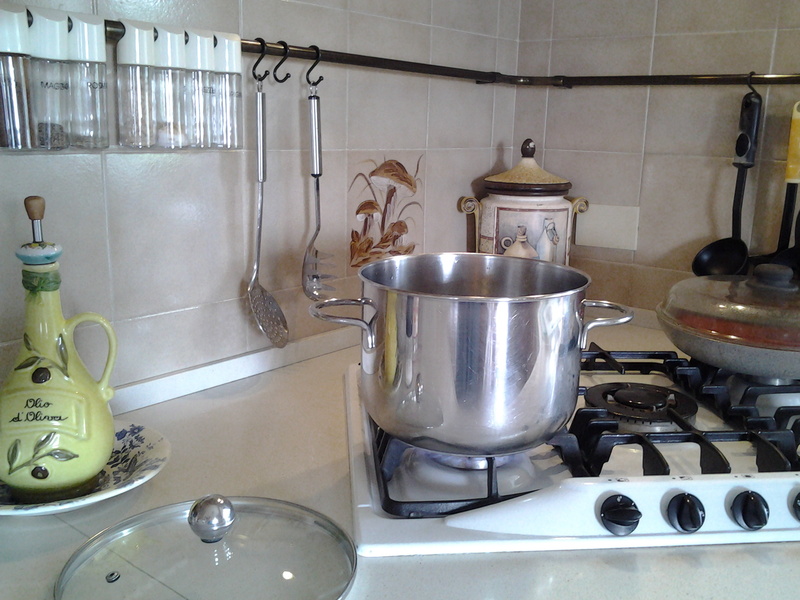 Put the pot lid on to bring the water back to the boil quickly, but watch the pot as it boils over easily. Once you have a rolling boil again, you can remove the lid. 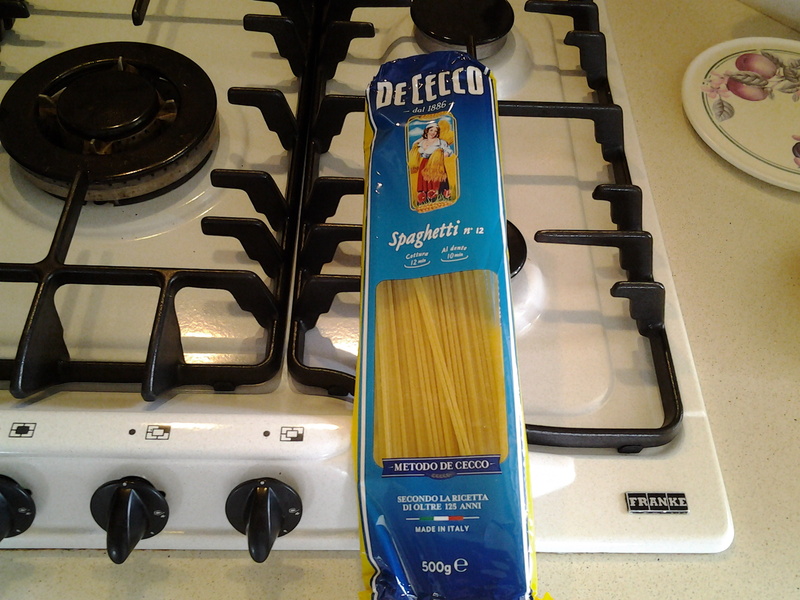 Use a long fork or spaghetti spoon to agitate and turn the pasta now and then while it cooks. This will help prevent the strands from sticking to each other. Cook until the spaghetti is cooked enough for you. It’s a personal thing. Al dente for most Italians means that there must still be a hard bite in the centre of the pasta. I don’t like that and cook until that bite is gone but the pasta is still relatively firm. About 14 minutes for this pasta. 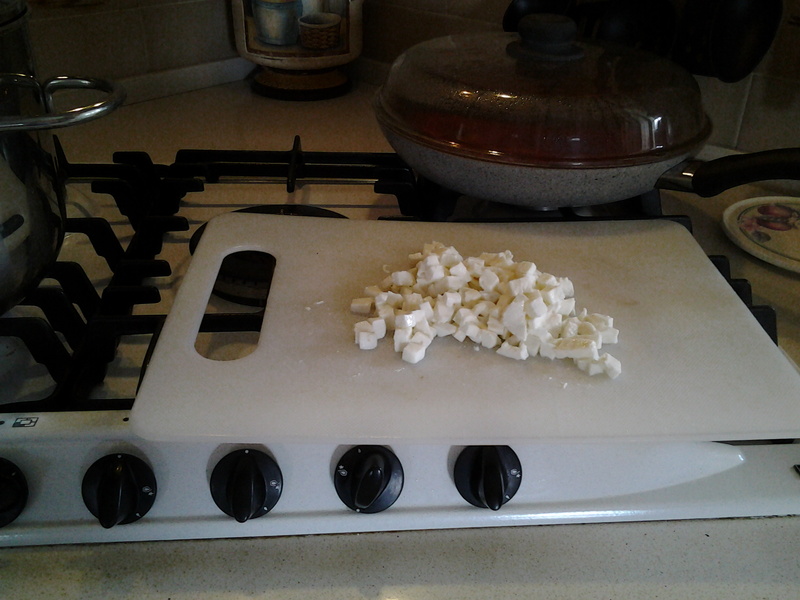 While the pasta is cooking, dice the mozzarella into small dices. Drain the pasta in a colander, keeping aside a little of the cooking water to add to your sauce if it’s too thick or too little and needs extra liquid. 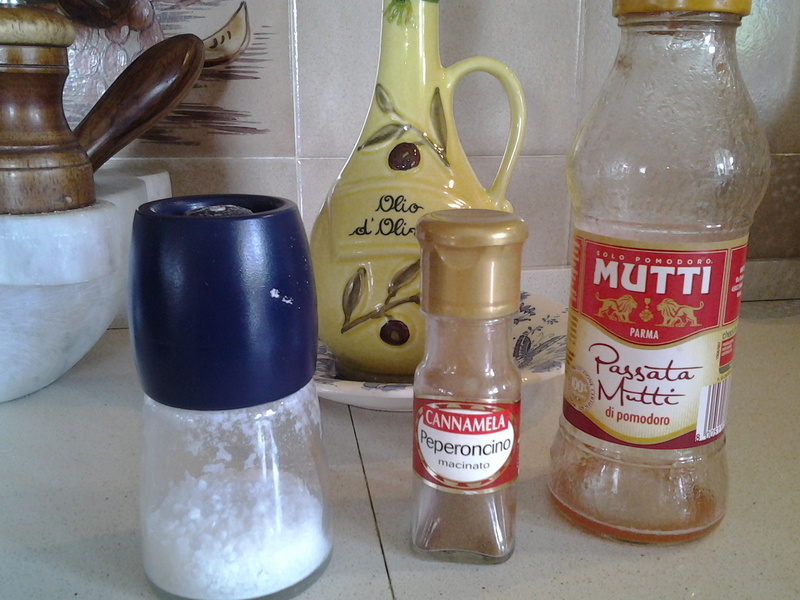 This is a trick all Italian mammas know and use to make a sauce stretch. It also helps make a sauce creamier. Put the spaghetti back in the pot and slowly add the hot pasta sauce, the diced mozzarella and the chopped basil, mixing gently. Add only enough to give the pasta a generous coating, not to drown it in sauce. I used about half the sauce and froze the rest for another meal. Serve with a little grated parmesan. Buon appetito! I love spring! The market suddenly blossoms with all manner of fresh, interesting vegetables and I browse the stalls with intense interest to see who has the biggest, brightest and crunchiest examples of my favourites. Piles of plump red and yellow peppers show off next to luscious purple brinjals. Nonnas and Mammas gently squeeze their flesh to gauge their freshness, exchanging opinions in the weak spring sunshine. No, these are not the best, they are rubbery and soft. Best to try the farmer’s stalls at the end of the piazza. My weekly visit to the Friday market this week saw me returning home with 1,5 kilos of fresh young spinach. These are not the large Swiss chard leaves that we ate in South Africa when I was a child, They are small, young, dark green leaves with the most delicious taste. But if you want the best from your veges, you have to treat them right. Here’s what an Italian Mamma does with her spinach. The leaves are bound to be dusty, even if they have been washed, so as soon as you get them home, give them a good wash under running water. Then dump them in a deep sink or bowl filled with fresh cold water. Take a large pot or deep pan and trim the roots and any unhealthy leaves from the spinach, dropping the leaves into the pot as you go. Look out for the initial leaves of the plant. They are long and narrow and must be thrown out as they will be starting to deteriorate. When the pot or pan is full, put it on the stove and start cooking the leaves. You can add a little salt to the leaves if you like. Do not add water as they cook in the water left on them. When the leaves are wilted, the spinach is done. It only takes a few minutes. Drain the leaves in a colander. Repeat the process untill all the leaves are cooked. Leave the spinach to cool. When the spinach is cool, ask a big, hairy husband to squeeze the hell out of that spinach, forming small balls that you can put in the fridge (or do it yourself). The more water you squeeze out, the better the spinach keeps. It will keep in the fridge for between 3 and 5 days. 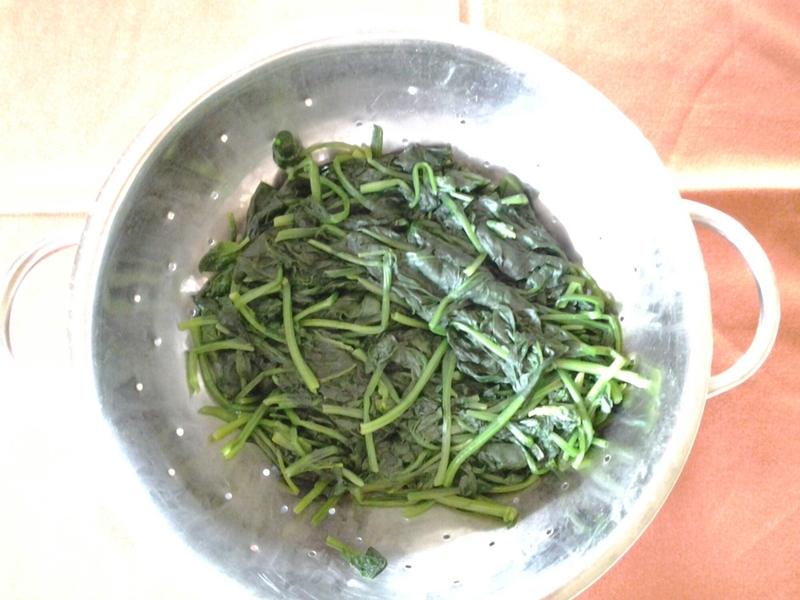 This is a common way for an Italian Mamma to store spinach. In fact, you can even buy balls of cooked spinach from the supermarkets here. It can now be chopped and served as a salad with salt, pepper, olive oil and lemon juice. Delicious! 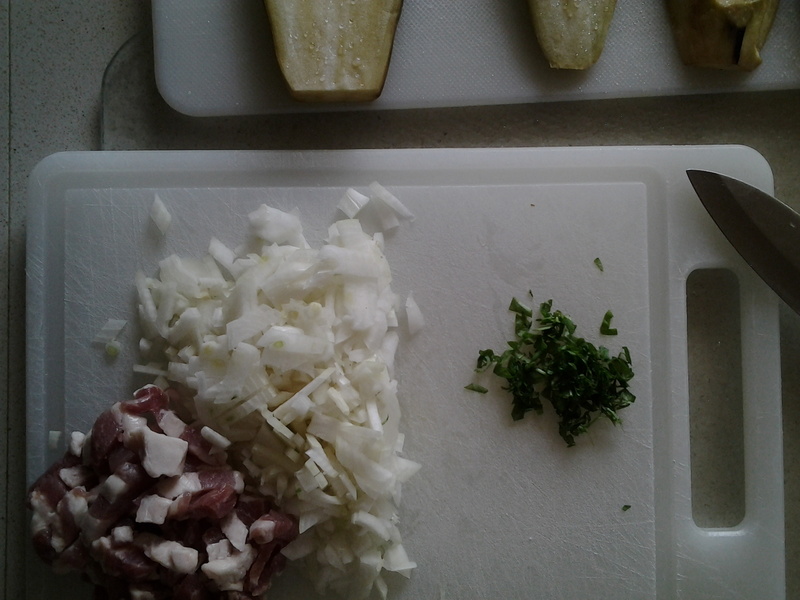 Or if you like, it can be gently fried after chopping. Depressions are made in the spinach and eggs lightly poached in them. A delicious brunch with bacon and toast. A perrenial favourite at Easter is the “Easter tart”. The filling is a delicious blend of spinach, ricotta cheese, parmesan, eggs and nutmeg wrapped in puff pastry – one of my favourites! Hmmm… which one shall I make this week? And what’s your favourite spinach dish? Let me know in the comments. Feeling musical today and although this is a sad song, the voice, interpretation and musicality are beautiful. Let me know in the comments if you like it, and I may post more of her music as well as her husband’s. Double trouble, double blessings, plus one = triple blessings! That’s right. Twins! This celebration is one of the best. My daughter-in-law is expecting twin girls. Sadly, the distance between us means that we won’t get to hold them and love them as much as we would like. But we will be sharing in the joy and excitement of the arrival of these two precious babies. And we pray that they, their siblings and their parents may be blessed and sustained throughout their lives. Their arrival turns a family with two children into a family with four children. Yikes! But wait. There’s more! 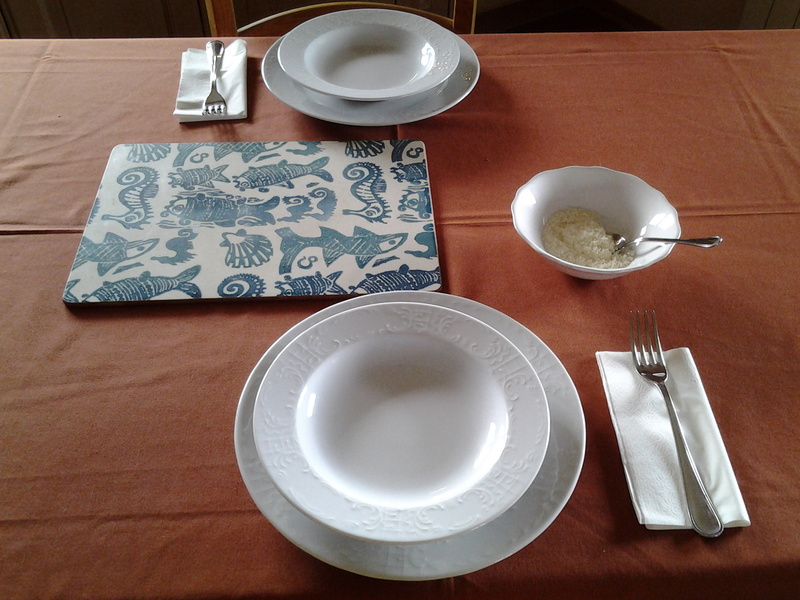 My daughter, who lives near us in Italy, is expecting her first child. For the first time I get to share in the pregnancy. We feel incredibly blessed to be able to share in her pregnancy, seeing scan pictures and hearing about her experiences. And we know we will share in this baby’s life in a meaningful way. We are truly blessed and very thankful! Because surviving a day is something worth celebrating. Because some people open our eyes to Truth and Beauty. Because some people fill us with Courage when they share their Stories. Inspiration for great lessons, tips to become a better teacher, and research on education. Twelve years of experience in the ELT, education and more!